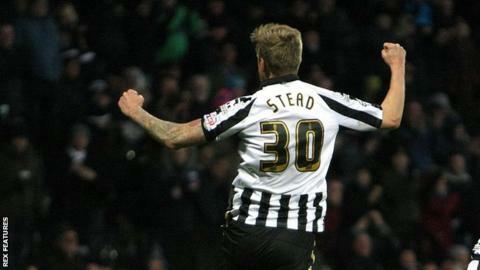 Jon Stead says his return to a more traditional centre-forward role is getting the best out of his talents. Stead has scored three goals in three games as Notts County have won three from five under Jamie Fullarton. But Stead was often deployed wider and deeper by previous boss Ricardo Moniz. "The problem was Ricardo didn't really know me as a player. The new gaffer wanted me straight back up top and that is where I am utilised best," the 32-year-old told BBC Radio Nottingham. Stead has managed a total of 11 goals in 32 appearances this season, with seven in his last 12 matches. But he said he is much more comfortable playing centrally. He added: "I have moved back to what I am used to, playing up top and coming to link at times. "Playing deeper and wider is a different part to my game and I enjoyed it, but it's not what I have been doing for the last 15 years and I feel like I am more effective playing down the middle, playing with somebody." And he said his chances of adding to his goal tally have been improved greatly. "It has helped playing in a more central role," Stead said. "I am getting more scoring opportunities and am getting in better positions on the pitch to get the chances. I am pleased with my return so far."